The northern cardinal is a favorite of many backyard birders. This colorful male was photographed in late January as it extracted a black-oil sunflower seed from the shell. Photo by Kevin Naze. One thing I’ve learned through the years is to not judge a book by its cover. Take hunters and wildlife watchers, for example. Nationwide, statewide and locally, nonhunters far outnumber hunters, but credible national surveys find the vast majority of nonhunters are supportive of regulated hunting. Fewer than one in five nonhunters, in fact, actually oppose hunting. There’s far more to hunting than killing, but you can’t camouflage the fact that in order to put a meal of wild game on the table, a hunter must pull the trigger on the targeted bird or animal. Now let’s look at wildlife watchers. Their thrills also come with close encounters of the wild kind, but many are armed only with binoculars and do their shooting with a camera. But wait a minute. Have you ever considered that many of us who hunt — probably all, in fact — are also wildlife watchers? The most passionate among us very likely observe more birds and animals than many who don’t hunt simply because of the long hours spent in wild places scouting, hunting or just hiking with the family. Many hunters savor wildlife sightings at home, too, through the magic of backyard birdwatching. Whether experienced in the field or out the window, wildlife encounters shared with nonhunters can open the door to conversations about the importance of habitat and hunters’ contributions in support of wildlife and wild lands. We’ll take a look at that sometime down the road. For now, let’s focus on the beauty of backyard birding. 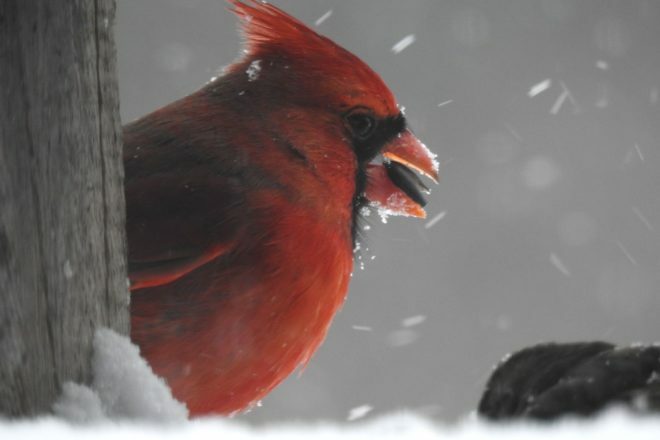 A female northern cardinal and a male house finch (front left) feed during a late January snowstorm. Photo by Kevin Naze. Attracting birds to your backyard in winter is all about food. Topping that list is black-oil sunflower, loved by all desirable species. Safflower, nyjer thistle, suet and peanut chips are great, too. Unless you want to draw flocks of sparrows and other less-desirable species, steer clear of cheap bags with fillers such as milo or mixes dominated by red millet and cracked corn. Many species enjoy pine cones packed with peanut butter and rolled in seeds. Creating them and finding the perfect spot to hang them outside can also be a fun family activity. Cover is important, too. If you don’t have much, think about what you could plant this spring that will make your yard more bird-friendly. A mix of evergreens, trees and shrubs is ideal. There are dozens of good books about birding and many online articles about improving habitat and dealing with pesky squirrels. If you would rather talk with someone, the Sheehy brothers at Havegard Factory Outlet on Highway 42-57, just west of Sturgeon Bay, know their stuff. They have a full line of bird-feeding products and a wide variety of feeders on site. Once you’re set, you may want to participate in the 21st annual Great Backyard Bird Count (GBBC) Feb. 15-18. Launched in 1988, the GBBC was the first online citizen-science project to collect data about wild birds and display the results in near real time. More than 160,000 people worldwide are expected to participate. All it takes is at least 15 minutes on one or more days of the count, when you tally the numbers and kinds of birds you see from any location. Those who are new to the count or who haven’t participated since the 2013 merger with eBird will need to create a free online account to enter checklists. You can also download the free eBird app to enter data on a mobile device. Last year, GBBC participants in more than 100 countries counted more than 6,400 species of birds. 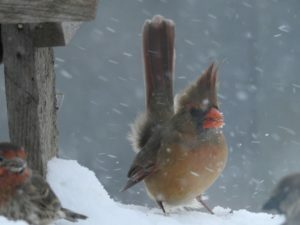 Explore the data and post your own photos at gbbc.birdcount.org. The GBBC runs for just one four-day weekend, but Project FeederWatch runs all winter, through April 5. Your bird counts help ornithologists track long-term trends in winter bird distribution and abundance. New participants receive a research kit with complete instructions, a bird-identification poster, calendar, 16-page year-end report and the digital version of Living Bird, the Cornell Lab’s award-winning quarterly magazine. The cost is $18. Learn more at feederwatch.org. A great place to pick up tips and share photos and information is Wisconsin eBird at ebird.org/wi/home. You can also scour data and check out hotspots from around the state. The Wisconsin Society of Ornithology’s website – wsobirds.org – is another good one to bookmark. Stay abreast of the latest bird sightings in the state and other news through an email sponsored by the Wisconsin Birding Network. Learn more and sign up at freelists.org/list/wisbirdn.